COSLOW-SPIER-BRITT Was it a Dream? Ormandy (born Jenö Blau, in Budapest on 18 November 1899) is glowingly recalled in these tightly packed CDs. Inevitably the sound speaks eloquently of the age of the recordings. The first disc in particular rustles with 78 surface sizzle. Mark Obert-Thorn's artistry in treading that line between synthesised 'perfection' and the coarse authentic glow is much in evidence. He is not afraid (nor should we) of background noise and it remains in place, uncompromised, as does the spick and span liveliness of the original sound. The first five tracks (1923-28) chart Ormandy's early career as a violin virtuoso whose tone production was remarkably even and smooth, without treacle. Rather like Sammons he seems to have taken that small step into hotel style. He conducted a salon orchestra. Here the sentimental overlay is queasy - green to the gills in the Brahms, and Hosmer. The year after recording those two pieces his collaboration with the Dorsey orchestra was very little different. The gloopy slow slalom is still in evidence. These tracks are, for me, more of a curiosity than a musical joy. Arnold Zemachson (1892-1956) was a Lithuanian. His Chorale and Fugue stands in direct line to the Bach-Stokowski arrangements - stately and proud in the chorale and mercurially flighty in the fugue. Eugene Zador (1894-1977), rather like, Weiner, Marx, Zeisl and Weigl, awaits discovery. I keep expecting Chandos to launch one of its ambitious series to record the orchestral Zador. His Hungarian Caprice is restful without being specially arresting. The tarogato (sounds like a cross between a sax and a cor anglais) solo is charming. The music crosses boundaries traversed by Franz Schmidt in his Hussar Song Variations, Kodaly, and Rózsa but undercut by a sentimental accent. Of remarkable value is Ormandy conducting Griffes' Pleasure Dome. The recording was made in 1934. Surely this was the premiere recording of the orchestral version. This is the first really testing piece on the disc and Ormandy and the Minneapolis players pass with flying colours encompassing the darker miasmic passages as well as the oriental festivity elements of this superb score. Rimsky, Bax and Scriabin were the names that occurred to me as I listened. 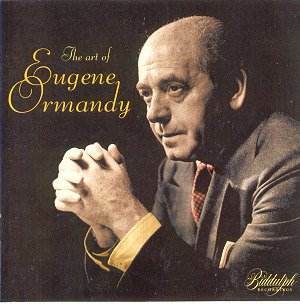 Ormandy is very good at the restful muse (5.10) as well as Vathek-like belligerence. Ormandy was with the Minneapolis orchestra from 1931 to 1934. Another American classic is Roy Harris's contrapuntally active Overture using a song which he also used in other pieces including The Folksong Symphony (No. 4). Ormandy's clean and unsentimental treatment brought out the Modernist tendencies of the Russian school. Ormandy makes the work sound more dangerous than any other version I have heard. The work is alive with Harris fingerprints familiar from the Fifth and Seventh Symphonies. My only criticism is of the watery and wandery brass chorale at 3.03. Barber's First Essay is rather relaxed and softened in Ormandy's coaxing hands. It lacks the oppressively neurasthenic 'edge' which many more modern performances (e.g. Measham and the LSO on an old Unicorn LP) give the piece. Menotti's overture to the opera Amelia Goes to the Ball is as flighty as Bernstein's Candide, Barber's School for Scandal, Arthur Benjamin's Italian Comedy Overture or Bax's Work in Progress. The second disc includes more substantial fare. Miaskovsky (a particular interest of mine) basked in international success during the 1930s and 1940s before plunging back into obscurity. Reiner, Stokowski and Ormandy conducted his symphonies in the US and Henry Wood, Nikolai Malko and Boult in the UK. His 27 symphonies span the early years of the twentieth Century through to 1950. The present symphony was commissioned by the Chicago SO and premiered by them under the title 'Symphonie fantaisie' on 26 December 1940. Contrary to some beliefs his music is not uniformly gloomy. Symphonies 18, 23 and 26 are rather folk-like in many respects. Many are however prone to a typically lugubrious tendency which in Miaskovsky's eloquent hands can be extremely powerful. CDs of Miaskovsky (beyond the Cello Concerto) are rare birds. There is currently no competition for the symphony although in the past it has been recorded by David Measham (Unicorn), Morton Gould (BMG-RCA - has this ever been reissued on CD? ), Gauk and Ivanov (both Melodiya). New Miaskovskians will want the set for this alone. The playing is staggering driven by the furnace of Ormandy's will in the rapid central gallop section. The Sinfonia Domestica is held together by Ormandy with tight reins. Truth to tell the work is more of a curiosity than anything else. It is not in the same league as Don Juan, Heldenleben or Zarathustra. It is skilled and affectionate and receives a performance to match but in the Strauss league it for me falls well below the Alpensinfonie grouping more easily with Macbeth and Aus Italien. Mahler enthusiasts will not want to miss Ormandy in a Hollywood performance of the Eighth Symphony. The ecstatic charge of the singing and playing speaks volumes of the sense of occasion engendered by Ormandy. There will be more than a little frustration that a complete taping was not available. As the notes warn, the recording was made up of a series of discs and there are volume variations in the transition from one disc to another. The disc is agreeably packed in a single width jewel case. The notes are worth reading with photos of Ormandy. Pity Biddulph couldn't muster a photo of the younger Ormandy. The set is all the more attractive as the whole Biddulph line moves to mid-price. The set is de rigueur from many viewpoints: for violin fanciers, for Ormandy enthusiasts, for the pursuers of the fabulous Philadelphians' wonder years and for Mahlerians who will grind their teeth as much as they celebrate.